When a license is activated, an activation is consumed from the license of serial number. Remember activations are only allowed if an Activation limit is present in the license. Because activations can be limited or exhausted, in certain situations it might be needed to free one of those activations so the customer can use it again. For example, it might be that the customer bought a new computer and would like to transfer the license from the old to the new one but because the software can’t be activated, you’ll need to release one. 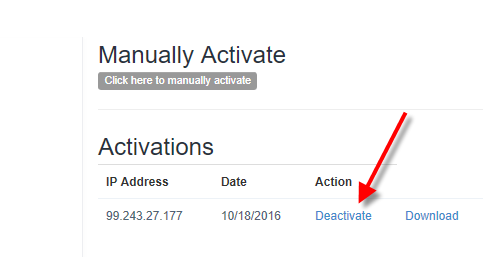 You can deactivate an activation two ways: through the LicenseSpot web interface or via code. Via the LicenseSpot web interface. Go to Licenses on the left menu and search for the serial number that would like to free an activation. Click on the serial number and on the left you’ll see how many time the license has been activated. Click on the deactivate link to free an activation. This option allows the customer to deactivate the license right from within the app itself. You can provide this functionality by calling the code below. When a license is activated, the Hardware ID of the machine where the activation occurred is saved as a record in LicenseSpot. When the license is deactivated, the Hardware ID of the computer is used as a key to find the corresponding activation to deactivate it (because the same license could have been activated on another computer and we need to keep that one active). One thing to keep in mind is that if the license is activated multiple times on the same computer, it means that LicenseSpot has multiple activation records with the same Hardware ID and when a deactivation happens, LicenseSpot picks one of them to be deactivated which might still leave the license valid on the client (because another activation still exists with the same Hardware ID). In this case, it’s better to deactivate all activations on the LicenseSpot web interface or simply create a new license.